Do you plan to participate in the Great American Smokeout this month (Nov. 15) and kick the nasty habit once and for all? We all know that smoking is an addiction which produces withdrawal symptoms when stopped. But did you know that the physical withdrawal symptoms last only a few days to about a week. After that, it is the psychological symptoms (cravings) that are the most difficult to overcome. But cravings will lessen the longer you resist the urge to smoke until finally, you find that you really have quit smoking. Some people say they smoke because it helps to keep them from gaining weight, and experts have said that it is common for people to gain some weight when they give up the habit permanently. Since smoking increases metabolism, quitting causes your metabolism to slow slightly; however, most smokers gain less than 10 pounds. 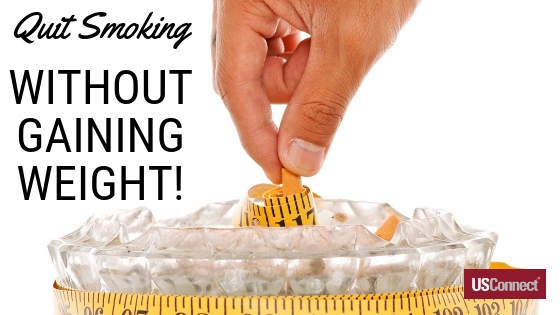 For those who gain more weight, it is likely that they use food (especially sweets and high-caloric foods) to help curb nicotine cravings. 1. Plan for healthy eating before you quit smoking. Stock your kitchen with healthy food choices so when the urge to snack hits, you will have them within easy reach. You may start to crave sweets after you quit (your sense of taste and smell improve)—and satisfying these cravings can prevent you from reaching for a cigarette. Just make sure the sweets you eat are not calorie-laden, sugary treats. (Fruits like grapes, strawberries, sugar-free candy and gum are acceptable substitutes). 2. Substitute the cigarette in your hand with something else. 3. Drink lots of water. It not only keeps your body hydrated, but also fills you up and lessens the desire to snack. 4. Amp up the exercise! If you are sedentary, adding exercise or increasing the exercise you already do will increase your metabolism. Walking and extra 30-45 minutes a day can make up for the metabolism slow-down from quitting smoking and keep your weight stable. Smoking releases thousands of toxic chemicals into your body, which damage your heart, lungs, and other organs. But quitting, even after years of smoking, can reverse these effects and add years to your life.